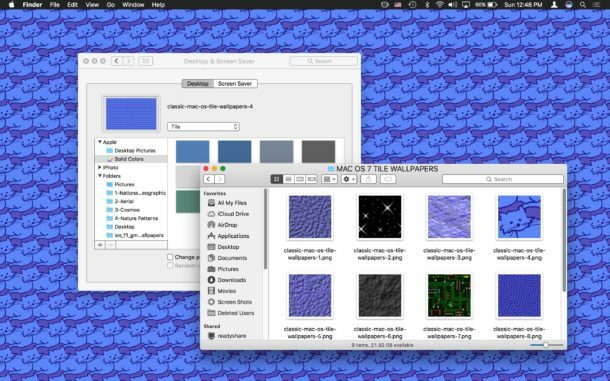 If you’re an extra longtime Mac user, you might remember way back in the 1990s when desktop backgrounds on classic Mac OS versions were tiled images of various textures. This was way back when the idea of setting a single image as wallpaper was a bit extreme because it was excessively resource heavy, and so tiling a small image was the norm instead (if not using just a solid color as a background) – the good old days of computing, right? 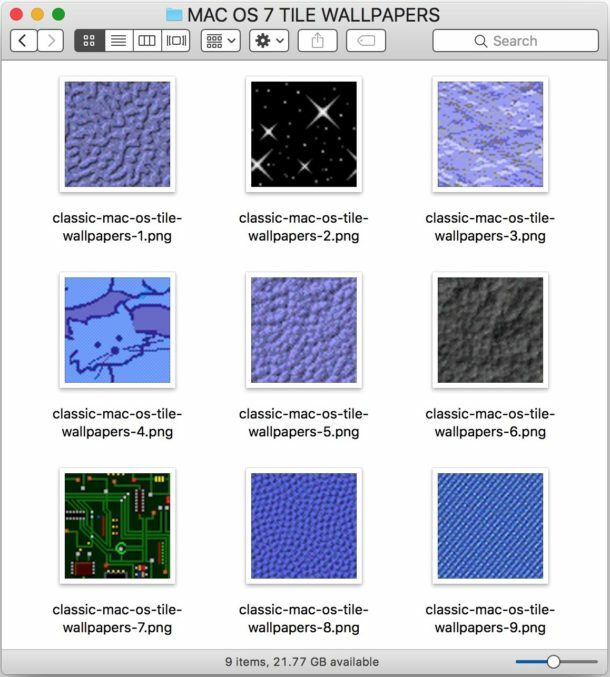 Well, why not bring a handful of those classic Mac OS System 7 tiling wallpapers to your modern Mac? 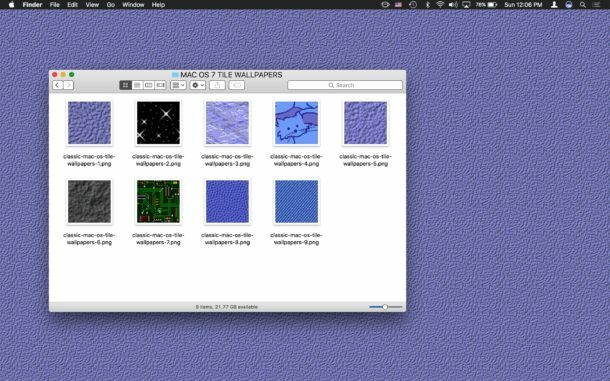 We’ve got a variety of the textured classic tiles from ancient Mac OS System 7.5 releases, some look like cheesy 90s housing wallpaper, there’s a curious flying cat, a motherboard circuit, stars, jeans, and plenty of blue and purple textures. The images from Mac OS 7 are 64 x 64 pixels, but I resized them to be 128 x 128 pixels so they show a bit more of the detail on a modern Retina Mac screen. They look about as good (or bad) as you’d expect. Doesn’t that look fantastic in that 90s retro kind of way? Well, as they say, beauty is in the eye of the beholder. Of course this is just a wallpaper, but if you’re feeling retro inspired then you can go a bit further and simplify the Finder appearance or use Increase Contrast on Mac OS to get a bit of a retrofied look in modern Mac OS and Mac OS X releases too. If those old wallpaper tiles are bringing back memories, you’d probably have some fun running classic Mac OS in a web browser with a Mac Plus emulator, or running Mac OS 7.5.3 with HyperCard in a web browser too, or you can use Mini vMac to run System 7 directly atop Mac OS and Mac OS X locally and not rely on a web browser at all. And if all of this is not enough nostalgia for you, we have many other fun retro computing articles to check out here . I remember thinking the circuit bread board was very high tech looking. How fun, the tiles look like they are from 1993 because they are! Ha! I recently got an old Mac Cube running Mac OS 9 from a friend who just last month *finally* updated to a new iMac 21″. The design of that enclosure Cube is still beautiful and it would make an amazing machine today if only it had modern internal components. The gumdrop iMac is also a classic. I am a sucker for retro Mac gear. I also wish it was easier to get a Macintosh Color Classic online, as well as a Mac Classic, if they had wi-fi I would undoubtedly use those as terminals around the house just for fun. Sometimes I want to hard mod the old hardware with modern LCD and components but it would be a huge undertaking. i seem to recall there were some Japanese modders who’d taken the Color Classic (CCII, maybe?) and fitted it with a flat panel display. i wish i had the room for a bunch of classic hardware. i wish i still had all my old machines, even my old //e. it didn’t do a lot by modern standards, but it was a great computer all the same. The early iMac G4 can boot Mac OS 9 as well. Up to the 700 MHz version. Yes indeed. I would never part with my 700 MHZ iMac – our young grandsons love playing Bugdom! It also runs Appleworks 6, that I can use with its the database to print Avery Christmas Card (and other) mailing labels. The ethernet – direct to router – link gives a lightning quick startup for checking e-mails, etc. The reliability is rock-solid and it is surely the absolute pinnacle of Mac design elegance! Likewise, my original (Intel 2 GHZ) White MacBook in Classic mode does much the same and is also much quicker than either of our (Sierra) MacBook Pro or MacMini . . . but pity about impending Dropbox demise fo 10.6.8 users! However, MacAce inform me that their Macmate.me will continue to support both 10.6.8 and 4.ll for cloud storage on old Intel and PowerPC machines. Too bad iPad doesn’t support tiling wallpaper, these would look a,azimuth. Wow autocorrect is worse than ever before it’s had to believe this is what aitocorr3ct does today! I like the wallpapers but I hate autocorrect! I thought these tiled backgrounds looked crappy then, and they don’t look any better today. P. S. If you don’t like AutoCorrect, you can turn it off. There’s a setting for that. I don’t like AutoCorrect either, that’s why I don’t use it. 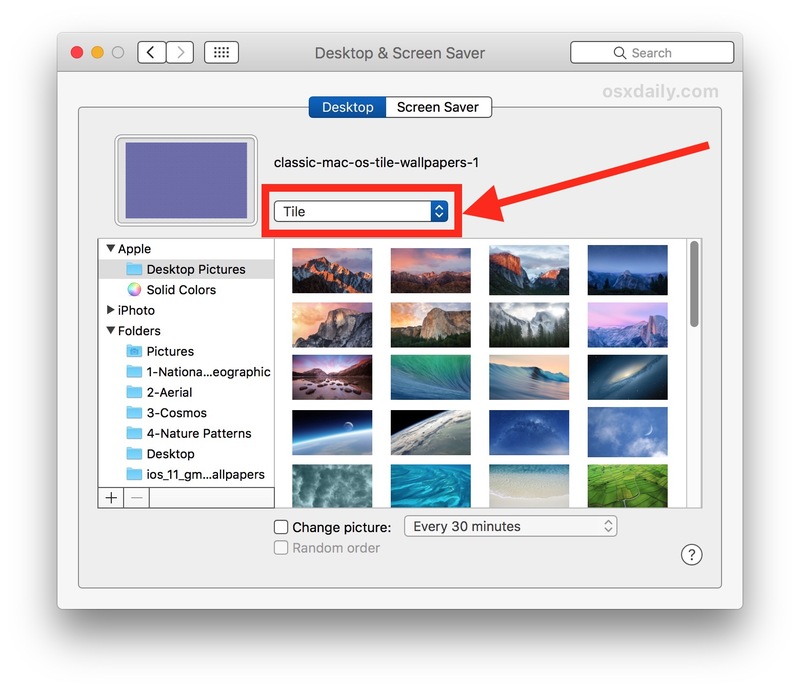 How do you save these tiled images to my desktop? Putting my cursor over each of these does notching into a link. Is there a website where these are located? Hope that helps! Some browsers are slightly different. Thank you. I see the error of my ways…….I didn’t realize that this was a manual process. Duh.